In response to a laudatory article about the non-union Kaleidoscope Chamber Orchestra titled “This orchestra wants no conductor: How Kaleidoscope aims to move in different directions” published in the LA Times by Rick Schultz on Feb. 13, 2019, we share another view written by AFM Local 47 Director Vivian Wolf. 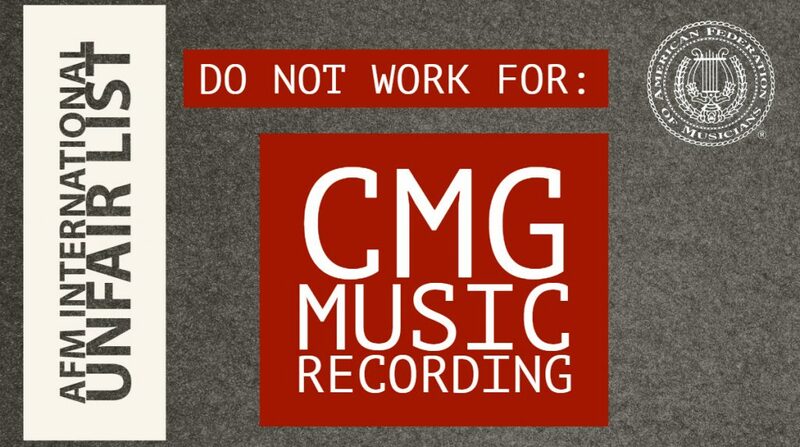 Kaleidoscope refuses to sign onto an AFM contract and currently appears on the union’s Do Not Work For list for failure to pay musicians according to industry standards. Along with the entire Executive Board, Wolf is deeply concerned about this situation, and Local 47 will continue to reach out to Kaleidoscope in order to discuss organizing the orchestra and its musicians under an AFM agreement. This entry was posted in All News, Features and tagged Kaleidoscope Chamber Orchestra, non-union, organizing, union busting on April 16, 2019 by admin. 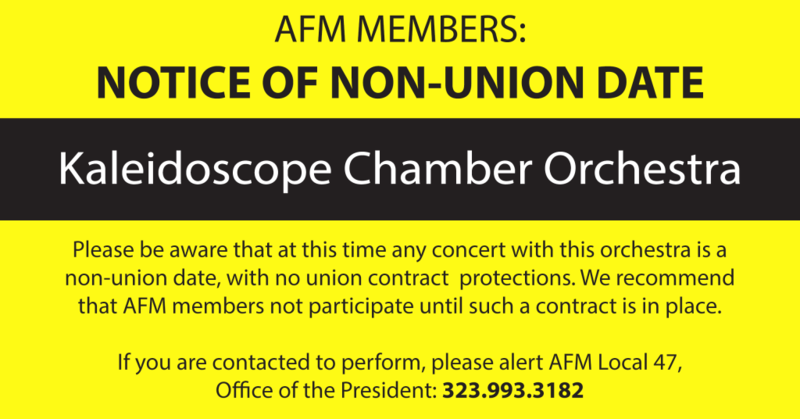 AFM Local 47 has been in discussions with Kaleidoscope Chamber Orchestra, a conductorless chamber orchestra based in Los Angeles, to try and bring them into an appropriate AFM contract. Unfortunately they have not agreed to sign on to a union agreement. Their next concert takes place Nov. 18, 2017 at Walt Disney Concert Hall. If you are contacted to perform with Kaleidoscope, please be aware that at this time it is a non-union date with no union contract protections. We recommend that AFM members not participate until such a contract is in place. Any musician performing at a major venue like Disney Hall deserves to earn a fair wage and benefits in line with industry standard. By making orchestras available for dirt cheap, employers come to expect bargain rates that undermine musicians’ ability to pay their bills. Members contacted to perform with Kaleidoscope are encouraged to alert the President’s office at 323.993.3181. This entry was posted in All News and tagged Kaleidoscope Chamber Orchestra, non-union, non-union date on November 16, 2017 by admin.